In his introduction to Patti’s Smith’s gloriously strange and vivid 2018 book The New Jerusalem, Dutch writer Rob Riemen asks the essential question about one of the world’s great and famously invisible artists. “In our own times, how many people besides Patti Smith can still see the relationship between Christ and art?” Riemen writes. He acknowledges being startled during a conversation with Smith when she identified “Christ, of course,” as a member of the “religious family of artists” that includes Blake, Shelley, Oscar Wilde and Albert Camus and an infinitude of others. “Christ? An artist?” a startled Riemen responded. The exchange occurred after Riemen cold-called Smith to ask her to be part of his Nexus Institute symposium about “the New York counterculture as a university of life.” He was delighted when she accepted, and obviously trepidatious when he met her for the first time in the Gotham coffee shop where she writes. Reading between the lines, it’s equally evident he might have come with great expectations of encountering the Miss Havisham of the mid-1970s, if not wearing the perpetual wedding dress of Charles Dickens’ jilted spinster, then trapped in punk-era skin befitting a lover of Robert Mapplethorpe and the backroom darling of Andy Warhol’s menageries. She was always, in her deep bones, through her powers of observation, perception and perhaps above all spiritual intuition, an artist of infinitely greater power than the period rubrics that tend to confine her reputation. Smith herself has confirmed her debt of genesis to those figures, and to that mad floating countercultural carnival, in two sumptuous memoirs Just Kids and M Train. But to read the lucid prose of those books is to be galvanized by an unavoidable recognition. She was always, in her deep bones, through her powers of observation, perception and perhaps above all spiritual intuition, an artist of infinitely greater power than the period rubrics that tend to confine her reputation. Godmother of punk? Yes. Okay. For a season or two, as it pleased her. It helped her achieve Rock and Roll Hall of Fame-level fame, kind of like, you know, Neil Young. Or Def Leppard. But Smith, as her indefatigable band of devotees never tire of reminding a myopic world, was a poet first, and the punk flowed out of the poetry, and the punk qua punk passed, but the poetry, the Christ-artist imagination that feeds her visual art and her prose work as well, grew and flowered, and flourishes yet, though she turns 72 in December. She still tours emphatically. A great friend of mine saw her perform in Dublin last June and was effectively speechless in trying to describe the sheer power and energy and artistic expression of the invisible and unsayable. In fact, on the day of the concert, my friend was touring nearby Kilmainham Gaol – where the savages of the British Army ordered the murder by firing squad of 15 brave and blessed Irish rebels following the glorious Easter, 1916 Rising – and she could hear Smith’s pre-show sound check through the old stone walls. She says her spine still hasn’t stopped shivering. In addition to the music and the touring, Smith published The New Jerusalem earlier this year, and added new material for her breathtaking Devotion, originally brought out by Yale University Press in 2017 and re-released last month in paperback. Both books are visionary quests that transform, into a question, Smith’s seemingly brash (though now recognizably humble?) contention to start the 1975 song Gloria (In Excelsis Deo), “Jesus died for somebody’s sins/but not mine.” As I argued in a review of Devotion last year, the question she seems to chase is this: “If not your sins, Patti Smith, then whose?” September’s re-issue of Devotion includes the fresh section Written On a Train, and it reveals in reproduction of her hand-written manuscript how meticulously she attends to that pursuit. With the inclusion of her own confident markings and firm crossings, Smith quietly affirms her place in the religious family of artists, augmented by an imagined vision of the ornate door that leads to Camus’ writing place, and of his then young daughter, Catherine, waiting for her papa to finish his work. More than domestic sentimentality, this is the union of art and familial love, of imagination and devotion in its purest sense. It is, in imitation of Christ, freedom sustained by imagination that cannot be achieved without imagination. Its antithesis is the spirit of the world that Smith assaults – there is no other word for it ­– with excruciating venom in the apocalyptic prose poems of The New Jerusalem, which are nothing if not a prophet’s cry against the modern mania for “God usurped by Goal. Chemical commerce the prime directive….enforced neo-naturalization, devoid of charity or human quality. Mercenary priests devis(ing) the moral centre. Iron and steel (rising) from the face of the holy city….” (“Matter of Time”). This is thanatocracy – the empire of death – gone to gore and madness. And yet there persists “The Alchemical Sovereign,” set on the facing page to a reproduction of da Vinci’s Salvator Mundi, wherein “salvation scavengers” recover from the “dust of labyrinthine cities” and the excavation of “monstrous vaults” an image that, passed from hand to hand, humbles all who gaze on it. Beyond the union of art and familial love found in Devotion, we have been moved to the marriage of Christ and art that is, to borrow a phrase from the unlikely source of Philip Larkin, a form of religious wounding. Or healing. “I wrapped my writing tools in a piece of chamois and returned to the strange corridor where the heart ceases to beat but does not die,” we read in the final prose poem “A Time of Gifts.” “Refreshed, it increases just as the tribe may increase, a tribe of one. You are born, says a voice. It is the voice of the sixth day; it is the voice of inexhaustible good,” say the last words in The New Jerusalem. Better yet, listen to Smith sing it in her voice that can make spines shiver through the stone walls of Kilmainham Gaol, and sound like a cry to God. If that does not settle definitively the state of her official religious conviction, it certainly helps us with Rob Riemen’s question about who today can still see the relationship between Christ and art. 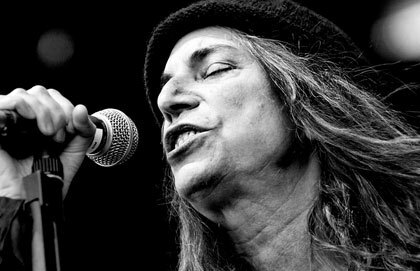 The answer, uniquely hers even within the religious family of artists, is visibly Patti Smith.